3.6.6 "Search Engines don't read images." So what? Exactly as it says above, if something′ s written on an image, Search Engines can′ t read this text. But you can save yourself trouble and write nice ALT texts for all your images. In fact, every image needs an ALT text. It′ s a brief description of the image, that′ s put in the image tag. ALT text is absolutely required by HTML standards. And, if you run your page through w3c validator like you did earlier, you′ ll see that it just won′ t let you go without ALT texts. If you disable images in your browser and load a new web page, you′ ll be able to see the ALT texts of the images. 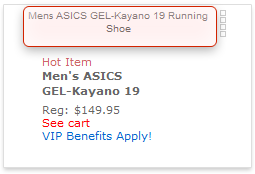 On the right, you see the ALT text "Mens ASICS GEL–Kayano 19 Running Shoe" instead of the image showing the shoe itself. Here′ s the thing: if there weren′ t any text, Search Engines wouldn′ t notice the image. 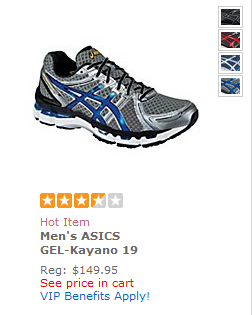 They only see the ALT text saying "ASICS Running Shoe". As Search Engines pay attention to ALT texts, they can be used for SEO. For instance, quite a lot of businesses get very good traffic from Image Search. And, if there were no ALT texts, image search just wouldn′ t work. So, to get some more traffic, you should use keywords in your ALT texts. And, one more thing to remember. People can also see these texts. Some of your visitors may use special browsers for people with visual, hearing, or other impairments. Others will view your site without downloading any images. The ALT text will tell everyone what′ s on the image, no matter how people view your site. DO IT NOW! Write good ALT texts for your images. Where possible, use your keywords in them. Make all changes available online. Links to your page must contain your keywords! Check the links to your landing page, the one you′ re making right at the moment. Now, add keywords to the links′ texts. Just to let you know... This text you see on the link and click on is called anchor text. The anchor should contain keywords specific for the page to which the link leads (not for the one where the link′ s put). If you link from a page about dogs to a page about cats, the anchor text should say "cats". Now make good keyword–rich and logical anchor texts. Learn more about tours to the Caribbean. And, if you don′ t have links to this page yet, put links immediately, and use keywords. Your links must tell what they really link to. But, again, never forget that people are going to read these texts. Sometimes webmasters use words just because they are good keywords — and never care what users will think. For instance, when I was looking to buy a turtle for my son, I clicked a link with an anchor "exotic pets" on some website. But all I found was all kinds of cats. Imagine my disappointment. In this case, the webmaster could write all cat breeds or cats for sale, or cats and kittens. Then, if users clicked the link, they′ d find what they expect. Yes, you can "cheat" Search Engines, but it′ s important not to cheat real users. DO IT NOW! Make internal links with descriptive keyword–rich anchor texts. DO IT NOW! Add your new page to the Sitemap. Now, publish your page to the web server, and the first cycle of on–page optimization is over. DO IT NOW! Make your page available online. What would you suggest about the use of multiple anchor texts towards the same thing: the same keywords/keyphrases in anchor texts or different keywords that mean the same thing? Taking to account the latest Google updates I would recommend you to use your site URL as an anchor text for at least half of your links. I would also advice you to avoid using the brand names as an anchor text, instead try using such common anchor text as "Click Here", "Follow this link", "Go to our site" and ect. When i use internal links on my homepage, my site drops in Google. I tried this a couple of days ago and my site dropped like 5 ranks down. How come your telling me this is good for SEO while my site drops after putting internal links on it? Actually the fact that you have put some internal links on the homepage of your website can not become the reason for the drop in rankings. Most probably something else influenced the position downfall. If you still experience this issue, please contact Link-Assistant.Com support (http://www.link-assistant.com/support/) describing the situation. These guys will help you investigate the problem and find the solution. Is there any recommended number of internal links per page to improve rankings?? Anchor text is one of the really important part of SEO. It tells the robot what we are. I just can't believe it! I went through my web site and gave all the banners and headings an ALT Tag as a result my Alexa ranking went from 4,385,528 to 2,229,418 and that's BEFORE I start redoing my keywords and redesigning my landing page. BTW what sort of attention grabber can I use for my site that sells cloassic movies and movie related memorabilia? 1) How much internal links should I use? 2) Is there any penalty for using too much internal links? 3) Should I point all the internal links to the home page/same page? 4) If I don't use the internal links right this moment, will it hurt my rankings? 5) On which page should I put the internal links? You mentioned in earlier chapter that using an image as a link is not SEO effective. Does using ALT tags make a different or should I put an image and add below it a text link? A text link with a keyword-rich anchor is the best. If you can't have a text link with a good anchor, it's better to have an image link with a keyword-rich ALT text. Image with ALT is not as good as a text link with a good anchor. But still it's better than an image without an ALT text.